Enticing white jasmine and exotic ylang ylang is beautifully upheld by sensuous patchouli and sandalwood in the purest natural wax candle. 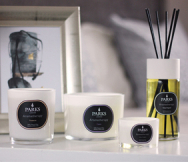 For over 20 years, Parks London candles have been renowned across the world for their purity and quality. Our Black Magic collection is made from finest natural waxes with soot-free wicks and sultry natural essences for a clean burn and seductive, long-lasting fragrance to fill your home with magic.